ŠKODA continues to grow: Over recent years, the brand has fundamentally expanded and renewed its model range. Now, ŠKODA’s SUV range is being strengthened. 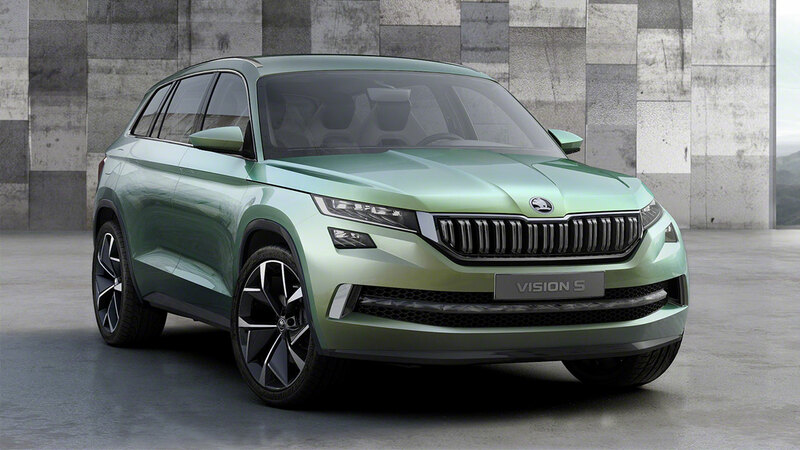 With the ŠKODA VisionS, the Czech car manufacturer gives an insight into how ŠKODA’s future SUV design language might look. The brand also presents its most important future technologies with the show car. The new ŠKODA Octavia vRS 4×4, the ŠKODA Octavia G-TEC with DSG transmission and the ScoutLine version of the Fabia Estate round off ŠKODA’s appearance at Lac Léman. Another highlight of the concept vehicle is its plug-in hybrid powertrain: with 165 kW (225 hp), the show car accelerates from 0 to 100 km/h in 7.4 seconds with a top speed of almost 200 km/h. 1.9 litres of petrol is all the car needs to travel 100 km (45 grams CO2 per kilometre). 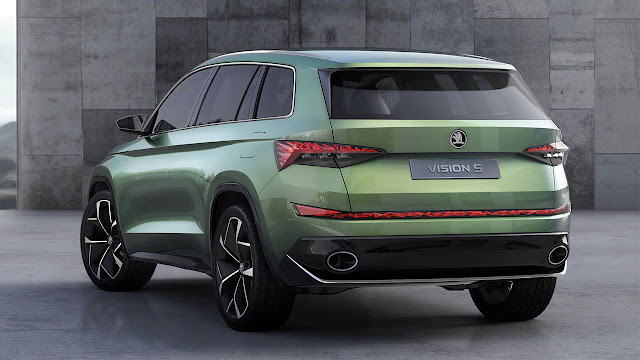 The ŠKODA VisionScan go up to 50 km on electric alone, and will travel up to 1000 km with both systems . The internal combustion engine is a 1.4 TSI with 115 kW (156 hp) and 250 Nm of torque. This works alongside an e-motor that provides 40 kW of 40 kW continuous power and 220 Nm peak torque. It is integrated into the six-speed DSG, which directs the power to the front wheels. A second electric motor with up to 85 kW and 270 Nm of torque drives the rear axle. This works independently of the front axle drive, meaning the show car has a smart four-wheel drive, which requires no mechanical coupling. The three engines cooperate in a highly flexible manner: The driver of the ŠKODA VisionS can choose between several modes of operation – from purely electric drive to charge modes, always with the goal of maximum efficiency. The lithium-ion battery with a 12.4kWh capacity is positioned in front of the rear axle. The ŠKODA Octavia vRS 4×4 will also be celebrating its debut at this year’s motor show: ŠKODA’s top-of-the-range Octavia is available as a saloon or estate with the 2.0 TDI engine with 135 kW (184 PS) and DSG transmission. With a drive unit, which is both sporty and safe, the Octavia vRS 4×4 makes a strong partner for families, work and leisure. The car accelerates from 0 to 100 km/h in 7.6 seconds and reaches a top speed of 228 km/h. In NEDC, the model will manage 4.9 litre diesel per 100 km; CO2 equivalent of 129 grams per km (all values for sedan). The ŠKODA Octavia G-TEC is particularly economical: It currently costs less than four euros in fuel to drive this model 100 km. On request, ŠKODA can fit the natural-gas car with DSG transmission. The 1.4 TSI provides 81 kW (110 hp) per km, emits less than 100 grams of CO2. The 1.4 TSI provides 81 kW (110 hp), emitting less than 100 grams of CO2 per km. The ŠKODA Octavia G-TEC is available in saloon and estate versions. ŠKODA’s ScoutLine range also continues to grow. Alongside the Rapid Spaceback ScoutLine, there is now the ŠKODA Fabia Estate ScoutLine – with its unique off-road look and attractive, practical equipment features. Three petrol engines with 55 kW (75 hp), 66 kW (90 hp) and 81 kW (110 hp) and three diesel engines with 55 kW (75 hp), 66 kW (90 hp) and 77 kW (105 hp) are available.